Our Personalised Star Wars USB flash drive from C L Promotions is a 32mb USB storage drive. This is truly an amazing product especially if you're a fan of the movies. All USB Flash Drives comes in various memory sizes and styles and shapes to suit everyone. So advertise your companies business details and logo on our Personalised Star Wars USB flash drive today and stay one step ahead in advertising. Available in many memory sizes and various designs. Please ring 01989 780727 for a FREE quote today! 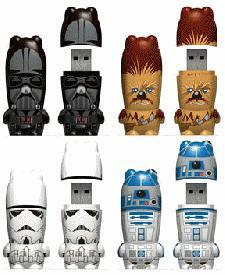 For more information about our Personalised Star Wars USB flash drive click here. To view our other Promotional items besides our Personalised Star Wars USB flash drive here.